This topic demonstrates how to use the Generate From Usage feature, which supports test-first development. Test-first development is an approach to software design in which you first write unit tests based on product specifications, and then write the source code that is required to make the tests succeed. Visual Studio supports test-first development by generating new types and members in the source code when you first reference them in your test cases, before they are defined. Visual Studio generates the new types and members with minimal interruption to your workflow. You can create stubs for types, methods, properties, fields, or constructors without leaving your current location in code. When you open a dialog box to specify options for type generation, the focus returns immediately to the current open file when the dialog box closes. 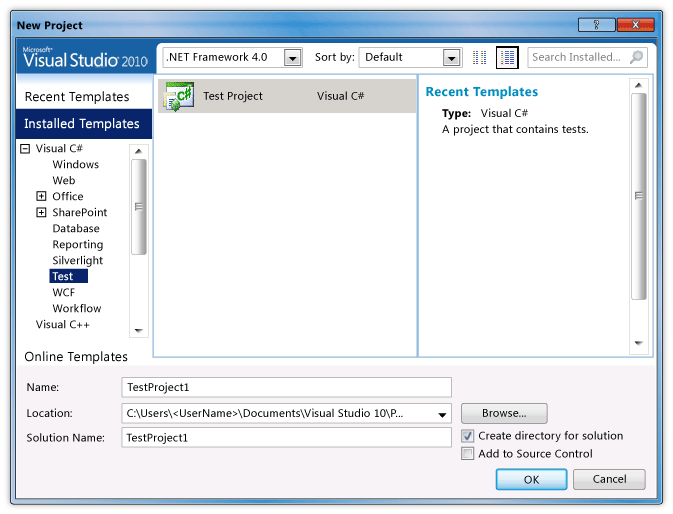 The Generate From Usage feature can be used with test frameworks that integrate with Visual Studio. In this topic, the Microsoft Unit Testing Framework is demonstrated. This walkthrough was written with Visual Basic or Visual C# development settings in mind. The walkthrough will also work with other settings. To change to the recommended settings, you can use this procedure: On the Tools menu, click Import and Export Settings. On the first page of the Import and Export Settings Wizard, click Reset all settings. On the Choose a Default Collections of Settings page, click Visual Basic Development Settings or Visual C# Development Settings. In Visual C# or Visual Basic, create a new Windows Class Library project. Name it GFUDemo_VB or GFUDemo_CS, depending on which language you are using. In Solution Explorer, right-click the solution icon at the top, point to Add, and then click New Project. In the New Project dialog box, in the Project Types pane on the left, click Test. In the Templates pane, click Test Project and accept the default name of TestProject1. The following illustration shows the dialog box when it appears in Visual C#. In Visual Basic, the dialog box looks similar. The test project contains a file that is named UnitTest1. Double-click this file in Solution Explorer to open it in the Code Editor. A test class and test method have been generated. Locate the declaration for class UnitTest1 and rename it to AutomobileTest. 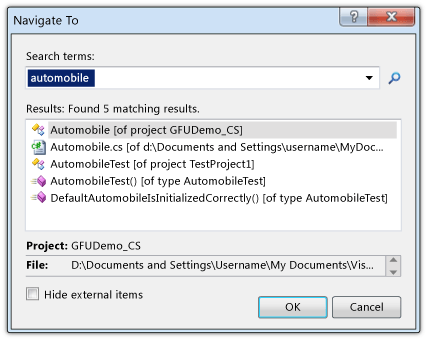 In C#, if a UnitTest1() constructor is present, rename it to AutomobileTest(). IntelliSense now provides two alternatives for IntelliSense statement completion: completion mode and suggestion mode. Use suggestion mode for situations in which classes and members are used before they are defined. When an IntelliSense window is open, you can press CTRL+ALT+SPACEBAR to toggle between completion mode and suggestion mode. See List Members for more information. Suggestion mode will help when you are typing Automobile in the next step. Locate the TestMethod1() method and rename it to DefaultAutomobileIsInitializedCorrectly(). Inside this method, create a new instance of a class named Automobile, as shown in the following illustrations. A wavy underline appears, which indicates a compile-time error, and a smart tag appears under the type name. The exact location of the smart tag varies, depending on whether you are using Visual Basic or Visual C#. Rest the mouse pointer over the smart tag to see an error message that states that no type named Automobile is defined yet. Click the smart tag or press CTRL+. (CTRL+period) to open the Generate From Usage shortcut menu, as shown in the following illustrations. Now you have two choices. You could click Generate 'Class Automobile' to create a new file in your test project and populate it with an empty class named Automobile. This is a quick way to create a new class in a new file that has default access modifiers in the current project. You can also click Generate new type to open the Generate New Type dialog box. This provides options that include putting the class in an existing file and adding the file to another project. Click Generate new type to open the Generate New Type dialog box, which is shown in the following illustration. In the Project list, click GFUDemo_VB or GFUDemo_CS to instruct Visual Studio to add the file to the source code project instead of the test project. Click OK to close the dialog box and create the new file. 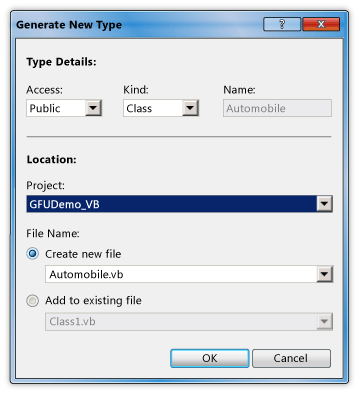 In Solution Explorer, look under the GFUDemo_VB or GFUDemo_CS project node to verify that the new Automobile.vb or Automobile.cs file is there. In the Code Editor, the focus is still in AutomobileTest.DefaultAutomobileIsInitializedCorrectly. You can continue to write your test with a minimum of interruption. Assume that the product specification states that the Automobile class has two public properties named Model and TopSpeed. These properties must be initialized with default values of "Not specified" and -1 by the default constructor. The following unit test will verify that the default constructor sets the properties to their correct default values. Add the following line of code to DefaultAutomobileIsInitializedCorrectly. Because the code references two undefined properties on Automobile, a smart tag appears. Click the smart tag for Model and then click Generate property stub. Generate a property stub for the TopSpeed property also. In the Automobile class, the types of the new properties are correctly inferred from the context. The following illustration shows the smart tag shortcut menu. Use the Navigate To feature to navigate to the Automobile.cs or Automobile.vb source code file so that you can verify that the new properties have been generated. The Navigate To feature enables you to quickly enter a text string, such as a type name or part of a name, and go to the desired location by clicking the element in the result list. Open the Navigate To dialog box by clicking in the Code Editor and pressing CTRL+, (CTRL+comma). In the text box, type automobile. Click the Automobile class in the list, and then click OK. The Navigate To window is shown in the following illustration. In this test method, you will generate a constructor stub that will initialize the Model and TopSpeed properties to have values that you specify. Later, you will add more code to complete the test. Add the following additional test method to your AutomobileTest class. Dim model As String = "Contoso"
After you generate the new constructor, a wavy underline appears under the call to the default constructor in DefaultAutomobileIsInitializedCorrectly. The error message states that the Automobile class has no constructor that takes zero arguments. To generate an explicit default constructor that does not have parameters, click the smart tag and then click Generate constructor stub. Assume that the specification states that a new Automobile can be put into a Running state if its Model and TopSpeed properties are set to something other than the default values. Add the following lines to the AutomobileWithModelNameCanStart method. Click the smart tag for the myAuto.Start method call and then click Generate method stub. Click the smart tag for the IsRunning property and then click Generate property stub. The Automobile class now contains the following code. On the Test menu, point to Run, and then click All Tests in Solution. This command runs all tests in all test frameworks that are written for the current solution. In this case, there are two tests, and they both fail, as expected. The DefaultAutomobileIsInitializedCorrectly test fails because the Assert.IsTrue condition returns False. The AutomobileWithModelNameCanStart test fails because the Start method in the Automobile class throws an exception. The Test Results window is shown in the following illustration. In the Test Results window, double-click on each test result row to go to the location of each test failure. If double-clicking does not take you to the test failure in code, you can enable this feature by performing the following procedure: On the Tools menu, click Options, then expand Test Tools and click Test Execution. Select the Double-clicking a Failed or Inconclusive unit test result displays the point of failure in the test check box. Add the following code to the default constructor so that the Model, TopSpeed and IsRunning properties are all initialized to their correct default values of "Not specified", -1, and True (true). When the Start method is called, it should set the IsRunning flag to true only if the Model or TopSpeed properties are set to something other than their default value. Remove the NotImplementedException from the method body and add the following code. On the Test menu, point to Run, and then click All Tests in Solution. This time the tests pass. The Test Results window is shown in the following illustration.